TEPCO's New Roadmap to .... Anywhere? And that is the aftermath of the March 11 earthquake and tsunami that hit Japan's Tohoku region very hard. As of May 13, more than 15,000 people have been killed, 9,506 are still missing, and about 115,500 are still living in 2,425 evacuation shelters, according to the National Police Agency. After more than 2 months since the quake and tsunami, the disaster-hit areas look almost the same as on March 11 after the tsunami. There are many areas still without power and water, and at some shelters the lack of food and water is chronic. At a shelter in Minami Soma City (large part of the city is now designated as "planned evacuation zone"), a meal used to consist of one riceball, banana and milk until very recently. PM Kan and his administration can plan all they want for their grand vision for Tohoku (those "eco-towns" made by shaving off the mountains, for example), but the reality on the ground is that no one in power is paying much actual attention. I joined "The 7th Tokyo Volunteer Work Tour" and arrived in Ichinoseki in Iwate Prefecture on May 11 with 79 others to help residents in various cities and towns in Tohoku. We went in as a team of 5. Our task was to pick up wooden debris out of the already-sorted-out rubble and to put them on the back of the truck. Wooden debris all came from somebody's houses. Fishing port was quiet. Bush warblers were singing. Cherry blossoms were still blooming. So calm and peaceful in the middle of devastation and desolation. Our task was to remove the sludge from under the floors of the kitchen, hallways, and bathroom. We put on the headlights to work. The husband and wife were very kind to us. We went to the Island on a ferryboat. I had seen tons of rubble for the past 2 days, but the sight of the port seen from the boat was simply shocking. 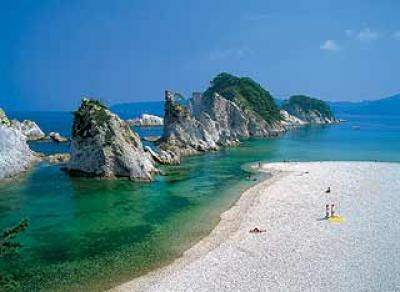 The same was true of what I saw after I arrived on Oshima Island. Piles of rubble and stacked-up cars. "When will this end?" I wondered. We joined other volunteers and 20 of us sorted out the rubble of a completely destroyed home of a fisherman. Fishing nets, net cords, wooden debris, clothes, plastics, pieces of glasses, metals, and so on. When the work was done and the fisherman's wife thanked us, I couldn't help crying. What did these people do to deserve this? Their school-age daughter was smiling and waving at us as we departed in a car back to the ferry. Rikuzen-Takata City was in a total ruin. Nothing but rubble, as far as I could see, 360 degrees. I could almost see the horizon. I was dumbstruck. There was a group of about 100 people in an strange uniform of navy blue and orange. It said "Keishi-cho [Metropolitan Police Department]" on the back. Actually witnessing a search party in action was a different kind of shock to me. Today's work was to sort out the rubble. Whenever we found letters, photographs, and records among the rubble, we asked the husband what to do with them. It was a hot day. We were treated by the family to slices of watermelon. It was delicious. Day 5: at a private home, Rikuzen-Takata, Iwate Prefecture. Today's task was to pitch tents. We started out by cutting grass, digging soil and leveling the ground. We spent the whole day pitching two big tents. It was almost frustrating what little we could do every day. Still, the the family would be using these tents, and that made me happy. One team was sorting out rubble at a private home and found a torn amulet of Amaterasu-Omikami, the Goddess of the Sun [one of the figures in ancient Japanese mythology worshipped in Shinto] . They asked the husband what to do with it. He said, "Throw it away, now that I know there is no god." My heart sank, hearing that. Another team did the task of neatly folding the clothes donated by people from all over the country, inside a shelter (a large gym in Kesennuma). They did not make eye contact with the evacuees, and they were not to be seen by the evacuees. I was told that was an unspoken rule. The reason for neatly folding clothes is to make them look as nice as possible so as to make people feel like wearing them. If people saw used clothes piled in a mess, they might feel insulted. A little consideration would make a big difference. I heard a story of a small group of local people having escaped tsunami by going to a shelter on a high ground. But there they became isolated. Night was cold. Frostbite and hunger came. They feared what would become of them. Then somehow, news arrived that in other places there were people alive and well. The isolated people were so happy to hear that, and said, "Let's not worry, the world has survived." The girl who told me the story said that important thing was not just doing the work but telling people around us about the reality of Tohoku. We saw it, heard it, firsthand. "Now it's time for us to go back to Tokyo and share it with others," she said. I couldn't agree with her more. While I was up there I met volunteers from all over the country and from foreign countries, too. Everywhere we went, local people on the street kept telling us "Thank you for your help." One old woman I met at a hot spring said to me, "I may not see you again, but I wish you good health." I will definitely go back, next time even by myself. Work is endless, the situation is truly awful. Volunteer workforce is far from sufficient. More needed, and longer. People of Tohoku were smiling and very strong. The sky was blue and the clouds were as vigorous as in summer. I have left my heart there. I will continue to get involved for as long as I can. This girl apparently had never seen Tohoku before the tsunami, and didn't know some of the beaches in the region used to look like this photo. All she saw was debris and rubble. It's sad, and is sadder that 2 months after the quake hardly anything seems to have "recovered" in Tohoku. The Fukushima I Nuclear Power Plant disaster casts a pall over the entire Japan, particularly over Tohoku, hindering recovery. I have been checking out your site every day, ever since you first posted about Fukushima at zerohedge. The real tragedy of the quake, w.r.t to people being displaced and lost to sea, has hardly received any coverage due to this nuclear situation. It's heartening to see stories like this about volunteers going to places affected by the quake and helping out. Please continue to cover stories about the quake-affected along with your excellent coverage of the Fukushima disaster. Thank you for all that you are doing. Lapri Did you remove this story or did blogger do another mini purge? I have the complete article you wrote with links if you didn't remove it and you want it back. I was going to comment but by the time I tried the page was gone. #Hamaoka Reactor 5: How Much of the Water Inside the RPV is Now Seawater? It shows how dysfunctional the corporate-run govts around the world have become - human life is worth nothing to them. Yet there are no victims. Where were these people when these plants were being built? Why don't people have the sense to use clean energy and respect their environment? Now it has come back to get them, and this is just the beginning. Stupidity has its consequences (and most people in the world are horribly stupid, not just the Japanese). Has anyone really learned anything from even this latest horror? I doubt it. It will be repeated many times around the globe. @anon at 9:06AM, Where were these people? Most of them were dead set against the nuke plant in their midst which would ship all that energy to big cities and leave them with nuclear waste, and they protested. Of course none of that has had any extensive coverage in the MSM. You think they wholeheartedly invited the plant in? The decision was made by pols, national and local, and the businesses that would hugely benefit. They were told it would be good for the community - more jobs, more tax money. If they were against the nuke plant, they were against the community. And remember, nuclear power was and still is, sold as clean energy and friendly to the environment. Ask Obama, who said so right after the accident, and who went to Chile to sell GE's nuke plant (and Monsanto's GMO) in exchange for the free trade deal, right after the accident. By the way the people in the report have been displaced by earthquake/tsunami, not by Fukushima accident. @robbie, this time I took it down. I'm rewriting it. I have experienced large-scale devastation firsthand as a hurricane victim in coastal S Florida (not even close to what parts of Japan just experienced), and one of the wierdest parts of that kind of experience is that by the time you actually get electricity & "mainstream media" back, days or sometimes weeks after the "event" happened, it seems like the world has forgotten or doesn't care anymore, and meanwhile you are sitting there seriously wondering what you are going to do when your batteries and peanut-butter packets run out? The nuclear story definitely must exacerbate this feeling (the few news stories we're getting out of Japan now are about Fukushima (and very few of those seem fully truthful/"trustworthy"), NOT about the tsunami victims out there starving for 3 months now). I pray that the tsunami victims of Japan know that other people around the world are aware-of and concerned-about their situation(s).